Having lived both in India and the US, any issue that links the two countries tends to perk my interest. Having studied about the environment and society, any issue that links the two also perks my interest. And when the issue is about all four? It’s a quadruple whammy. Straightaway, I had started to wonder what farmers in rural India think about the sudden profits they’re making from this obscure plant. Do they know why they’re making such a profit right now? Do they know how environmentalists in the US are fighting against fracking? How would they feel about that? For the first time, many of these farmers are buying cars and better educations for their children. This issue is especially poignant for my friend, Shailender, whose family is not only growing crops of guar right now, but is also supporting his studies in, none other than, environmental science. Do he and his family understand that they are in the middle of a huge environmental fracking debate in the US? I wanted to find out things from their perspective. He immediately agreed to an interview. 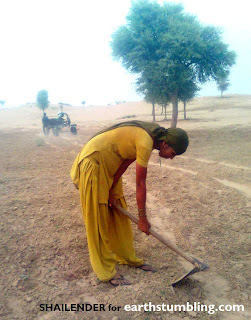 eStumbling: Your family is from Rajasthan, India and you plant guar. When did you start doing this? Shilender: Long before my birth. I have always seen guar in my field in this present season. e: How big was your crop last year? e: Has it always been the same price or did you see a big increase in the selling rate recently? S: About 9 to 10 years ago, it rose up to 10,000 rupees per quintal [roughly $2 US per kilo], but now the prices are very high. It was around 45,000 rupees per quintal last season [roughly $9 US per kilo]. e: What is guar used for? S: For feeding animals and people eat the pods of guar as green vegetables. e: Why do farmers think it became so expensive? S: Actually, the farmers know that it is exported to the USA and China. e: According to the farmers, why do people in the USA and China want so much guar? S: I’ve asked them and they reply that guar contains gum which is used for making explosive material. It is also used in making around 200 types of cosmetics. e: Interesting. Well, guar is also used in drilling for natural gas. Right now there is big business in the USA and China for natural gas, but people in the USA are fighting against this because it is not eco-friendly and pollutes drinking water. Have you heard about this? This is a drilling process called "fracking." S: Yes, I’ve read about it on your blog. e: Now that guar has become more financially beneficial, how has this affected farmers and their communities? S: They’ve becomes more rich. Peoples are happier now. e: Have people started to change their crops more and more to guar? Has this had any negative effects on society? S: Initially there was a negative effect because of rise in prices. People who sold guar at low prices got depressed and some even attempted suicide. e: I had mentioned that environmentalists in the USA are fighting against natural gas drilling (i.e. fracking). Actually, right now it is illegal in my state, but drilling companies are trying to make it legal. How do you think farmers feel about environmentalists fighting against this drilling which uses 80% of the guar gum that is produced in India? S: They're getting money which means they are building their livelihoods up to a good level. Some farmers even constructed homes so that they could live properly. I’d need to analyze it more to give a proper response. e: Well, how about your feelings? You are studying to be an environmentalist and your family grows guar. How do you feel about it? S: As an environmentalist, I want to say stop gas drilling. e: But your family will lose business, and many American’s don’t need to worry as much as Indian farmers do about money. Do you think this is fair? e: In terms of sustainable development, what do you think is fair for your family? S: Actually for me as a global environmental concern drilling must stop, but for my family they don’t understand environmental concerns so continuation of drilling is fair for them. e: For me it is a difficult issue. I could not say if it is right or wrong because on one side we want to see rural areas develop, on the other side we want to stop pollution of water and land, and on the other other side we need cleaner energy -- and natural gas is cleaner than petrol. 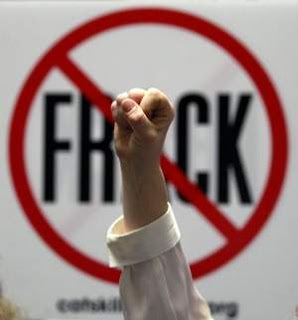 In my city there are signs on buildings saying, "NO FRACKING.” It is a big issue here. If you look on many environmental websites, they are always talking about fracking. This is important for Indian farmers since 80% of guar gum from India is used for fracking. S: That’s why it was difficult for me to reply to your questions properly. e: Stuff like this is probably why Rio +20 was considered a failure by many. You’re not alone in your confusion, even Obama doesn’t want to say anything about sustainable development. He didn’t go to Rio this year. S: There is only one solution: Samajwad for the whole world. e: Socialism? Why is that the answer? S: The solution to these questions arising from the fracking issue can be dealt with by socialism. I’ll email you about it. OK, good night. e: OK, send me some photos of your farm. After the chat, I started to think more about this strange turn of events. Normally, when talking about environmental policy and globalization, the emphasis is on how global policies have reduced pollution in developed countries only to have it exported to developing nations. Companies not only shift manufacturing to other countries, but also the pollution that comes with it. Here it’s almost the other way around. Rural India profits while the US gets polluted. I’ve yet to get Shailender’s take on fracking and socialism or understand what he meant by that. Maybe he was seeing how with this situation there is not only equalization in the distribution of wealth but also in the distribution of pollution. And by this the world’s scale again balances. Like two men on a tightrope exchanging bags of sand, it's only fair to distribute the weight. Gas drilling (fracking) in the US versus helping farmers in India. What do you think is fair? I selected this post to be featured on Environmental Blogs. Please visit the site and vote for my blog!